Some of the storm events that have been photographed over this below average season have been documented below with some information in regards to hail size intercepted. This hailstorm will go down in history as one of the most damaging in Sydney if not Australia. During the afternoon, an impressive amount of energy built up into a near explosive environment with very warm to hot and extremely sultry tropical airmass in place. Once storms developed, they did so explosively teaching high up into the atmosphere. Giant hail and storm splits occurred immediately. Storms moved rapidly pummelling anything in their path. In an unprecedented event, several rounds of supercell thunderstorms spawning further huge hailstones over near adjacent suburbs already impacted - a behaviour likely never experienced in Australia. About 11 storms with very large or giant hailstones were observed in regions from Sydney to the Central Coast to the Blue Mountains. The damage bill from smashed roofs and tens of thousands of anhialated is now exceeding 1 billion dollars. The number of vehicles assessed for damage now surpassing 72000 well beyond any other hailstorm in history. Severe storms affected the Hunter Valley region but most storms of more significant severity producing large hail were near the Karuah to Bulahdelah region. Hailstones to 3cm were widespread along this path perhaps larger in the main core as these hailstones were falling predoinantly ahead of the main core in the anvil region. A severe storm on Monday 23rd February exhibited classic supercell structure with very definite hailstones! The structure did not last for long before it went into a slow decline. Nevertheless althoguh Sydney area did not have any storms predicted storms did develop further west. Twice the storm tried to organise before basically sending up an impressive explosive updraft and organising rapidly. Several storms were reported with storms rapidly developing near Lithgow initially and also east of Mudgee a little later. There were likely two supercells out of this region. The Lithgow cell had an interesting base - this nice image of a base circulation and dimple of a funnel almost overhead. This coincided with a wind change in the near storm environmental boundary. This storm eventually moved towards but narrowly bypassed Singleton with very large hailstones. 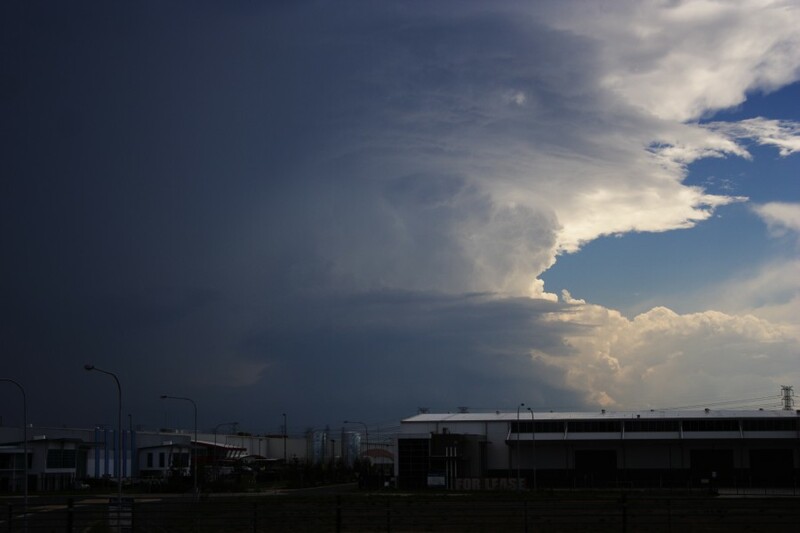 Another severe storm passed in the hinterland west of Muswellbrook - both this and the Singleton storm were likely supercells producing very large hailstones. Hailstorms Lithgow to near Lake Macquarie. 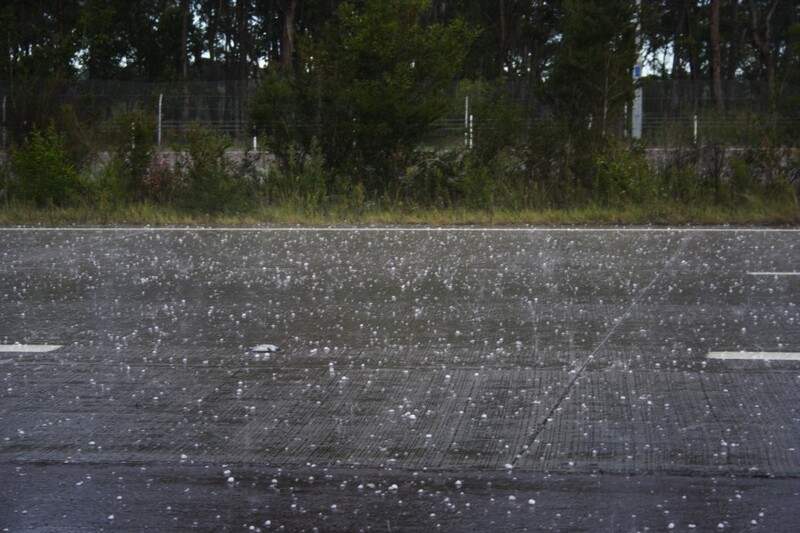 The storm that approached Lake Macquarie was a fast moving storm and dumped hailstones to a diameter measured at 4cm. It most likely was an elevated supercell and was interesting to watch as it altered its local environment suddenly clearing the low cloud as it raced across. Another sharp right moving storm approached Lithgow from near Mudgee and produced hail damage in Lithgow where The Dent Shed helped repair vehicles over the following weeks.